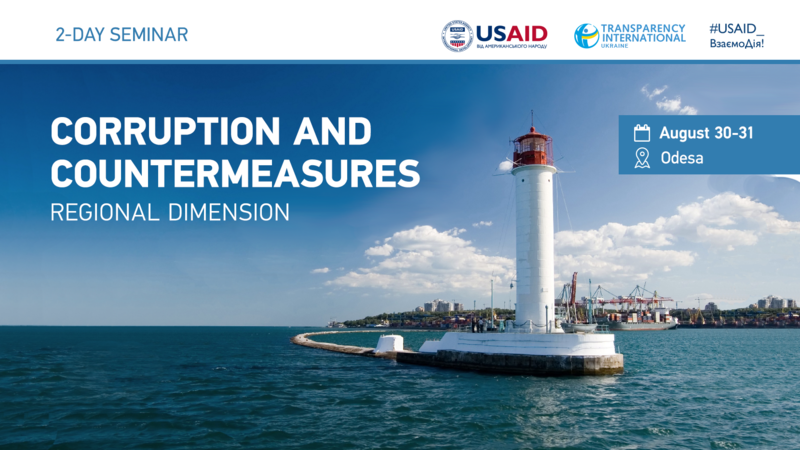 The Ukrainian chapter of the global anti-corruption organization Transparency International is holding a two-day seminar “Corruption and Countermeasures: Regional Dimension” in Odesa on August 30th and 31st. During this event, the participants will learn how to prevent acts of corruption at the local level and how to find support both among domestic and international NGOs. The participation is free of charge. The coordinators provide food and handouts. You will be informed about being selected for the workshop after registration additionally. If you have any questions concerning the event, please contact TI Ukraine’s regional coordinator Halyna Skalska at skalska@ti-ukraine.org. This training is conducted by Transparency International Ukraine with the support of the American nation, provided through U.S. Agency for International Development (USAID) as a part of the project “Support to Anti-Corruption Champion Institutions (SACCI) Program in Ukraine.” Any specific ideas expressed at the event and in the handouts and publications are the sole responsibility of the organizers and do not necessarily reflect the views of USAID or the U.S. Government.